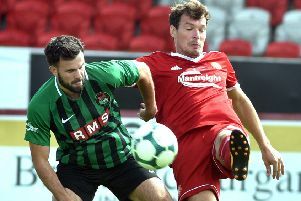 Ex-Dundalk, Derry City, Bohemians and Drogheda United striker Marc Griffin has signed for Glenavon on a one-year deal, with the option of a second. The 26-year-old, who was born in Melbourne, Australia, guested for Glenavon in last week’s pre-season games against Crumlin and Portadown. He is expected to line out for the Lurgan Blues in another pre-season friendly match on Monday 17 July. A Crystal Palace Development Squad will be the visitors to Mourneview Park. “Marc is a highly-rated pacey striker who has played for some of the top clubs in the League of Ireland,” said Glenavon manager Gary Hamilton. “He was recommended to me and I was impressed with him in our games against Crumlin and Portadown.